Minnow Cottage01263 715779work01603 870304fax Self-cateringA traditional Norfolk character cottage which has been nicely refurbished retaining the cottages original charm. The pretty front cottage style garden is a perfect place to enjoy an afternooon tea. Minnow Cottage is located in the central village of Docking which has a lovely village church, shop, pub, fish and chip shop and also a farmers market selling local produce every Wednesday. • General: Night Storage Heating, Freestanding electric Heaters, electric style wood burner. • Other: Towels, Travel cot, Highchair, Books and games provided. • Outdoors: Enclosed garden with tables and chairs. 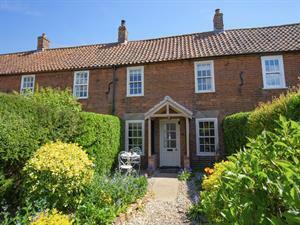 A traditional Norfolk character cottage which has been nicely refurbished retaining the cottages original charm. The pretty front cottage style garden is a perfect place to enjoy an afternooon tea. Minnow Cottage is located in the central village of Docking which has a lovely village church, shop, pub, fish and chip shop and also a farmers market selling local produce every Wednesday.